BMW factory at Chennai has started assembling the 7 series at its factory here in India. The 7-Series luxury saloon, it’s top spec luxury car model competes with the likes of the Mercedes Benz S-Class, Audi A8L and the Jaguar XJ. 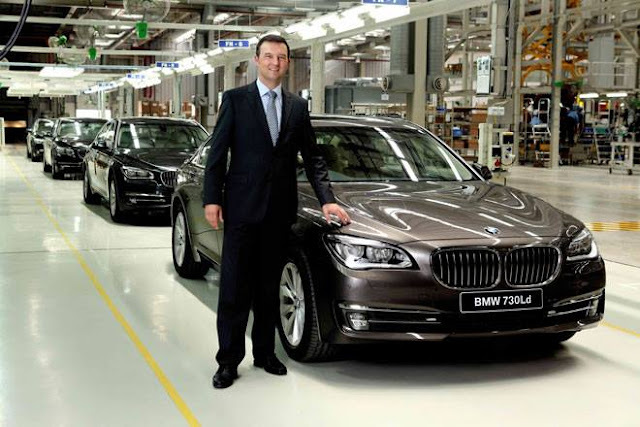 The assembled-in-India BMW 7-Series is the first car model in the 7-Series line up to be assembled in India. The CKD assembled 7-Series model is the entry level diesel engined 730 Ld variant of the car, the variant that brings in the maximum volumes. The factliefted version of BMW 7 series was launched about a month ago and available in both petrol and diesel variants. Powering the only diesel trim currently available to Indian 7 Series buyers is a 2993cc, in line 6 cylinder diesel unit. Fitted with a turbocharger, variable intake geometry and piezo injectors, the engine now delivers 261PS @ 4000 rpm as opposed to 234PS earlier, and torque has also gone up from 520Nm to 560Nm which kicks in as low as 1500rpm. The car is now mated to S-tronic 8 speed automatic transmission which covers 0-100Km in just 6.2 seconds. View more Images of the car assembled in India here.